With all of his spectacular spider-powers, like strength, speed and the ability to climb walls, all Spider-Man really wants is a jet pack. Oh look, a Spider-Man. I've managed to find three of the Walgreens Minimates sets I've wanted, and all of them have had a Spider-Man in them. The 'mate itself is a fairly standard Spidey, with a mildly cartoonish design, but nothing so exaggerated as to not look like a completely average Spider-Man. 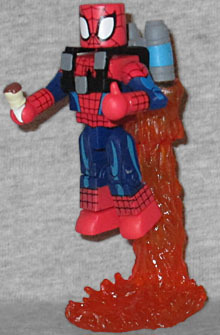 This one, dubbed "Jet-Pack Spider-Man," comes with an accessory you'd never be able to guess: a hand giving a thumbs up. Oh, and also a big jet pack. The pack itself is removable, but the short flames seem to be permanently attached to the pack (the taller ones are still separate). How is it we can get a thumbs-up hand, but still can't get a thwip hand? In addition to the plain Spider-Man head, there's a second with wider, "surprised" eyes. The 14th most popular hero in New York (above Spider-Man), Squirrel Girl has squirrel strength, senses and reflexes, and can talk to squirrels. Woo! 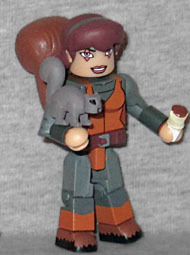 Squirrel Girl gets her first action figure! Created by Will Murray and Steve Ditko and introduced in 1991, Squirrel Girl is a mutant with the proportional strength, speed, and agility of a squirrel. Her costume is grey and brown, and the little markings over her eyes are painted on. She gets a rather substantial new piece, in the form of her big bushy tail - it's part of her belt. The set includes two burritos, which totally end up looking more like ice cream cones, but since Squirrel Girl featured in an episode titled "Burrito Run," we feel secure in declaring the items thus to be. Where most of the Minimates packages have text proclaiming "With Interchangeable Parts! ", this one proudly says "Includes Squirrels! ", and so it does. Three small squirrels, molded in grey and with touches of black paint to create their eyes and noses. Her first sidekick, Monkey-Joe, was a brown squirrel, but died after becoming a full member of the Great Lakes Avengers; her current sidekick is Tippy-Toe, a grey squirrel who wears a pink bow. All three of these squirrels are the same color, and none of them wear any bows. This entry was posted in Art Asylum, Marvel, MMMR and tagged Avengers, Minimates, Spider-Man, X-Men. Bookmark the permalink.